The Global Volcanism Program has no Bulletin Reports available for Maly Semyachik. There is no Deformation History data available for Maly Semyachik. There is no Emissions History data available for Maly Semyachik. The eastern margin of Karymsky caldera, which was created about 7500 years ago, forms the steep wall cutting across the center of the photo. Snow mantles the foreground flanks of Karymsky stratovolcano, which was constructed within the 5-km-wide caldera beginning about 5500 years ago. Fresh, dark-colored lava flows from Karymsky cover the caldera moat. 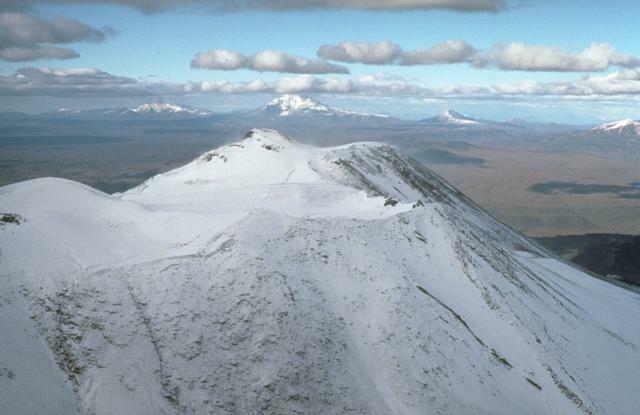 The complex, snow-draped stratovolcano to the NE is Maly Semiachik, which has also produced frequent historical eruptions. The broad Maly Semiachik massif, seen here from the SW on the flanks of Karymsky volcano, is composed of three overlapping stratovolcanoes constructed along a NW-SE line. The volcano was built within two overlapping Pleistocene calderas. 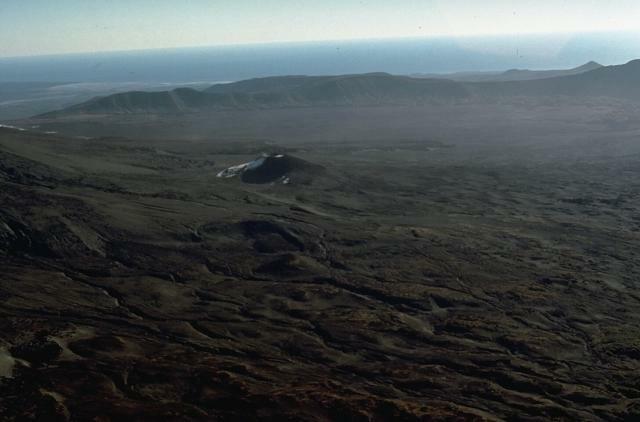 The rim of the larger 12-km-wide Steena caldera is visible on the far right horizon, but elsewhere its rim is largely buried. The late-Pleistocene to Holocene post-caldera massif almost completely obscures the rim of the inner 7-km-wide Maly Semiachik caldera. The summit of Paleo-Semiachik volcano forms the 1560-m high point of the Maly Semiachik massif. Paleo-Semiachik, the first of three stratovolcanoes constructed within two overlapping Pleistocene calderas, began forming about 20,000 years ago on the northern margin of the calderas. It produced lava flows that spread far beyond the caldera margins to the north and east before ceasing activity about 11,000 years ago. Activity then migrated to the SW, producing Meso-Semiachik volcano, whose slopes appear in the foreground. Volcanism along the elongated Maly Semiachik massif has progessively migrated to the south. The southern flank of the volcano is mantled by youthful pyroclastic cones and lava flows of Holocene age. The SE rim of the 12-km-wide Pleistocene Steens caldera forms the low ridge in the background, and the Pacific Ocean is visible in the distance. 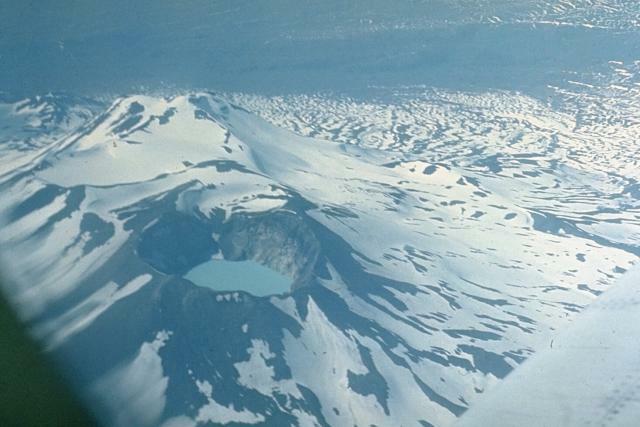 A crater lake occupies the summit of the youngest and southernmost volcano of Maly Semiachik. All historical eruptions of Maly Semiachik have originated from Troitsky crater. The conical peak in the middle distance is Karymsky volcano, 15 km to the SW. Karymsky was constructed within a Holocene caldera that truncates the southern flank of Dvor volcano (upper right). 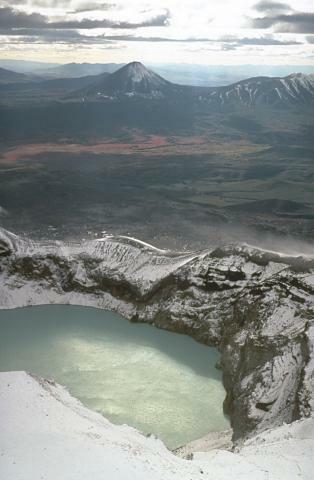 A crater lake fills Troitsky crater, the youngest of six craters capping the elongated summit of Maly Semiachik volcano in central Kamchatka. Steam rises from the surface of the hot, highly acidic crater lake in this early 1970's photo. The lake, which has a maximum depth of about 140 m, has been monitored since 1969. Temperatures as high as 41 degrees Centigrade have been measured, along with pH levels down to 0.4. 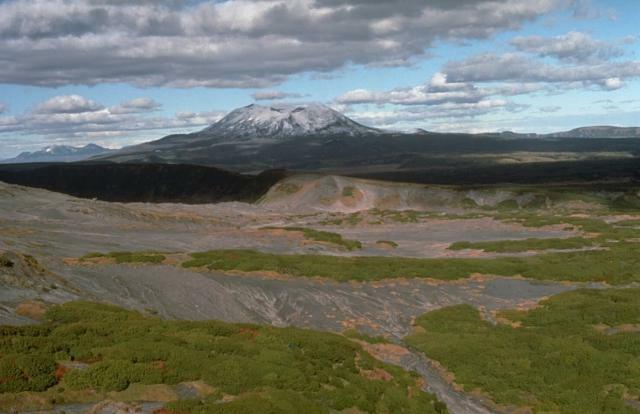 Maly Semiachik is a compound stratovolcano located within several nested Pleistocene calderas. Three overlapping stratovolcanoes were constructed along a NE-SW line. Activity migrated to the SW, eventually forming the youngest cone, Ceno-Semiachik. It is capped by the historically active Troitsky crater, which was formed during a large explosive eruption about 400 years ago. 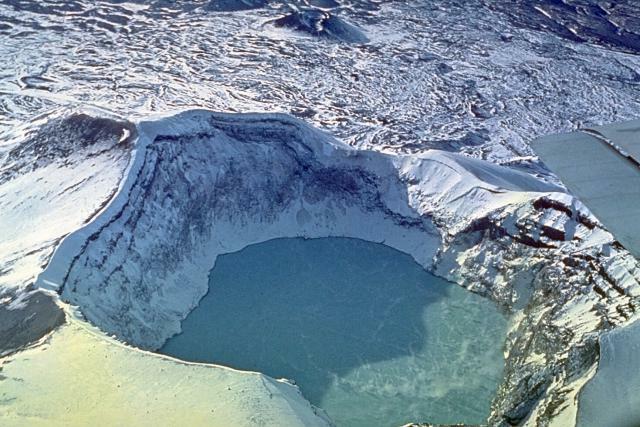 A hot, acidic lake fills the historically active crater. Photo by Oleg Volynets, 1972 (Institute of Volcanology, Petropavlovsk). The currently active Troitsky crater of Maly Semiachik was formed during an explosive eruption about 400 years ago. The eastern crater wall shows light-colored hydrothermally altered rocks of the vent complex that are overlain by darker lava flows and pyroclastic-fall deposits from eruptions that followed formation of the crater. A hot, acidic lake now fills the crater, which has been the source of all historical eruptions of Maly Semiachik. Troitsky crater, the youngest of six craters at the summit of Kamchatka's Maly Semiachik volcano, was formed during a major explosive eruption about 400 years ago. 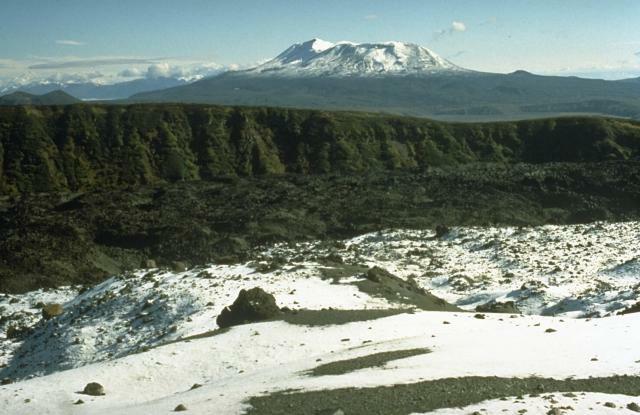 The crater, seen here from the west with the Pacific Ocean in the background, truncates the snow-covered slopes of Ceno-Semiachik, the youngest of the four overlapping stratovolcanoes that comprise the Maly Semiachik massif. The crater, now filled by a hot, acidic lake, has been the source of all historical eruptions from the volcano. 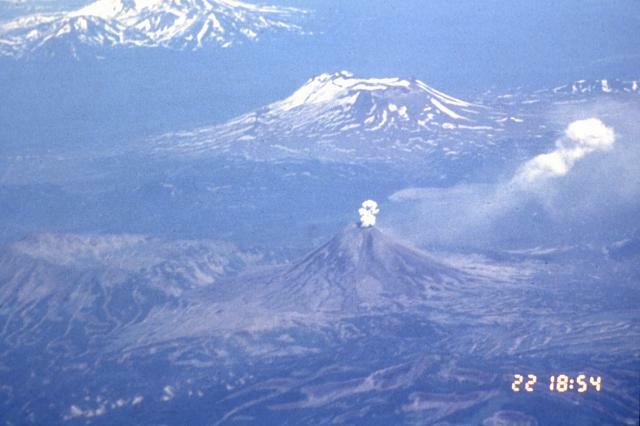 An aerial view from the SW on July 22, 1996 shows an eruption plume rising above the summit crater of Karymsky volcano with Maly Semiachik volcano in the center background. 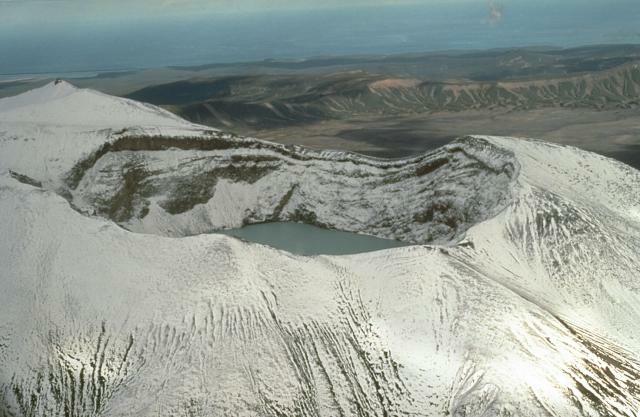 The 1996 eruption began on January 2 simultaneously with an eruption at nearby Akademia Nauk caldera, out of view to the right. 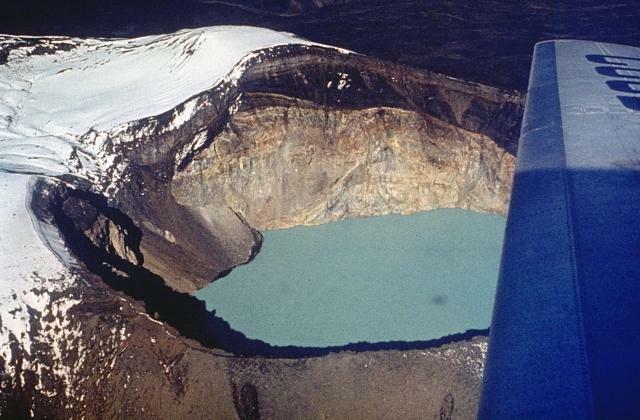 The Akademia Nauk eruption lasted only a day, but long-term eruptions continued at Karymsky. Photo by Phillip Kyle, 1996 (courtesy of Vera Ponomareva, Institute of Volcanic Geology and Geochemistry, Petropavlovsk). There are no samples for Maly Semyachik in the Smithsonian's NMNH Department of Mineral Sciences Rock and Ore collection. Large Eruptions of Maly Semyachik Information about large Quaternary eruptions (VEI >= 4) is cataloged in the Large Magnitude Explosive Volcanic Eruptions (LaMEVE) database of the Volcano Global Risk Identification and Analysis Project (VOGRIPA).